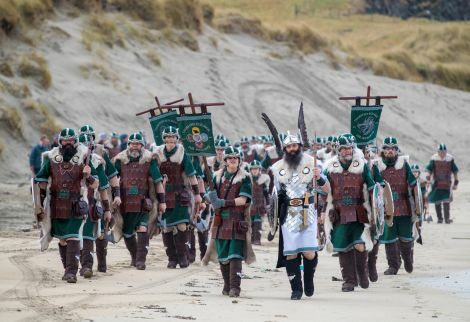 TODAY is the latest chapter in a 52 year tradition of Nicolson guising and jarldom in the Lerwick Up Helly Aa. Britain’s biggest fire festival has had its fair share of historic moments in the course of its existence, but this year’s festival sees a few more notable milestones and “diary entries”. John Nicolson is the third of three sons who have donned the armour, helmet and kirtle of jarl since their father Jim led the procession 40 years ago. Now 85, Nicolson senior will be stepping out again in the jarl’s squad with his three sons. John also happens to be the 100thjarl since the inception of “modern” Up Helly Aa. His squad – the Slantigarth squad – is also taking part for the 70thtime in its existence. It is an unprecedented representation of a single family, certainly in the recent history of the fire festival, though there have been three generations of Simpsons and two Mathewson brothers as guizer jarls. It is also remarkable that there have been three brothers on the committee at the same time. There are in fact five guizers left from the original Slantigarth squad of 1949 and they have all been invited to the civic reception in the town hall. “There are not too many squads that are that old, but we are now onto the third generation of them. There’s bairns and grand bairns from the original guizers. It is just a special year,” said John. Preparations for this year’s event have been “absolutely mental” and have involved veteran helmet maker Jim getting stuck in to preparing gear. As if that has not kept him busy enough, he also made the helmets for the Nesting 2018 jarl’s squad. 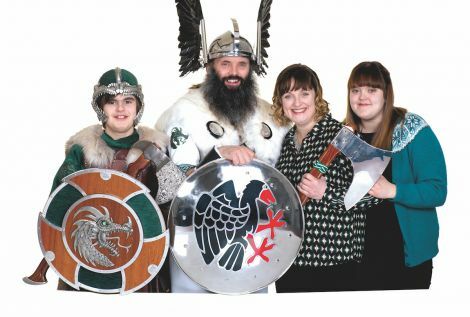 John, a 48-year-old self-employed painter, is the youngest of the three Nicolson boys and has been celebrating Up Helly Aa since he was a 12-year-old fiddle box carrier. He said: “1983 was my first year as a fiddle box carrier. American Pie, I’ll never forget it, in the Slantigarth squad. I have only missed one year since and that was when I was away at college in 1998, but I have been out every year from ’83 apart from that one. “When I was growing up, there was just the smell of paraffin at Up Helly Aa time because David and Graham were both torch boys and my memories are always of that: just the smell when they were working with it, coming in at two o’ clock in the morning, coming fae a steep, to get up at four and put the bill in ower at dawn. John said he enjoyed guizing for many years before turning a thought to joining the committee and thus the succession train for future jarls in 1998/99 when he also became involved in torch making as the event was “crying out” for torch boys. He said that he had resisted requests for him to stand for the committee for five or six years before throwing in his hat and being “lucky enough to get on”. “You enjoy it. Every year is different, but the same, if that makes any sense. You have a different act every year and everybody is getting a peerie bit older and you have younger boys coming through. So your squad is always changing. 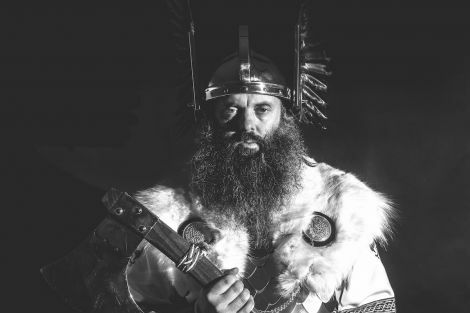 As well as the “fun and hilarity” of squad meetings and props sessions, the highlight of John’s experience was taking over as guizer jarl from Stewart Jamieson in October. “I was very nervous beforehand, just going into the unknown. When you get onto the committee you have 15 or 16 guys in front of you and then when you sit on the end of the stage with nobody in front of you, then you really know it’s your turn. The jarl’s squad gathering at Spiggie beach on Sunday. “When Stewart announced me the squad stood up and cheered and applauded me and that just took away all the nerves that I had; and that was probably the one individual highlight of a lot over the year,” said John. Other memorable events have included clay pigeon shooting, golf and a visit to the Brae jarl’s squad in November. John said his father was not one to court publicity, but that will not stop his son from mentioning him during the town hall reception today – which is bound to be a proud moment for all the Nicolsons. According to John, though Up Helly Aa nowadays receives routine international media coverage, it is still all about the guizers. “It always has been and always will be,” he said. “This time of year means a lot to me and my family and I will be proud to represent my family and Dad, David and Graham and their families, and everything to do with Up Helly Aa”. Of course the jarl himself will be clad in the traditional jarl’s garb that is handed down through the generations. Another curious factoid about this year’s Up Helly Aa is that John is one of several left-handed jarls in recent years – joining his southpaw predecessors Ivor Cluness and Mark Evans and committee member Callum Grains. Scalloway Fire Festival boss Maurice Jamieson is another “lefty”. John’s 13-year-old son Bobby is already involved as a fiddle box carrier with the squad and looks set to follow in the family footsteps keeping Up Helly Aa roaring in the future. John’s partner Dawn Anderson and daughter Chloe, 19, are also keen supporters. Chloe made the squad’s collecting sheet, which was “very well received”. With 53 adults, 10 bairns and eight musicians, the Slantigarth squad is maintaining the tradition of swelling in number when it is the jarl’s squad. Guizer numbers will be around 1,000 as has been typical in recent years. According to John that is “on the edge” of maximum numbers for Up Helly Aa. Looking ahead to 2019, the three brothers’ squads have all been invited to take part in New York’s Tartan Day Parade in April, which will mean about 85 squad members and their relations visiting the USA. There are also three Norwegians in the squad this year, who got involved through Lerwick Spurs’ trips to the coastal town of Måløy. So to reciprocate the squad is invited to Måløy Day. It also happens to be the 60th anniversary of the Måløy Galley which is used as a toasting vessel at the town hall reception.